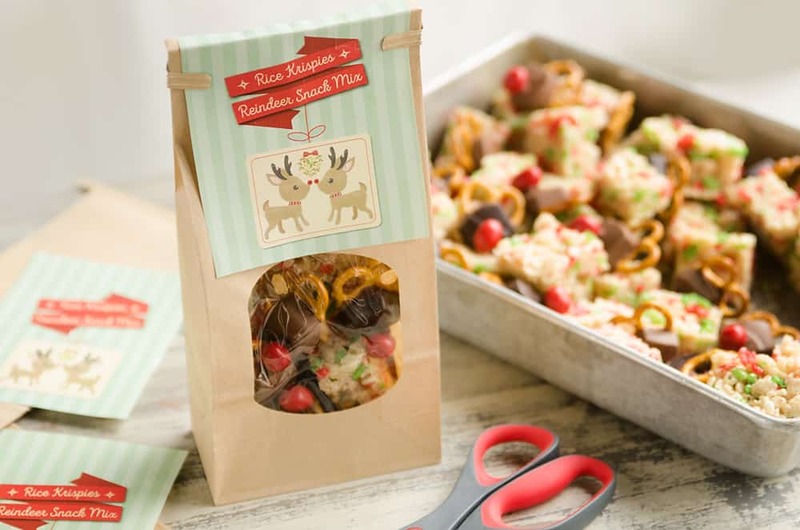 Peanut Brrr-ittle M&M’S® Reindeer Snack Mix is a fun holiday treat that is a perfect gift idea for kids and adults! 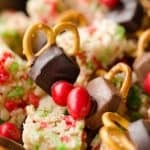 Homemade mini Rice Krispie treats are combined with Reindeer treats created with DOVE Chocolate, M&M’S, Pillsbury frosting & Pretzels. This post has been sponsored by Mars Wrigley Confectionery, US, LLC, Pillsbury™, & © 2017 Kellogg NA Co. All thoughts and opinions are my own. Do you struggle with gift ideas over the holidays for coworkers, neighbors or friends? If you are looking for a cute and affordable gift idea this season, look no further! 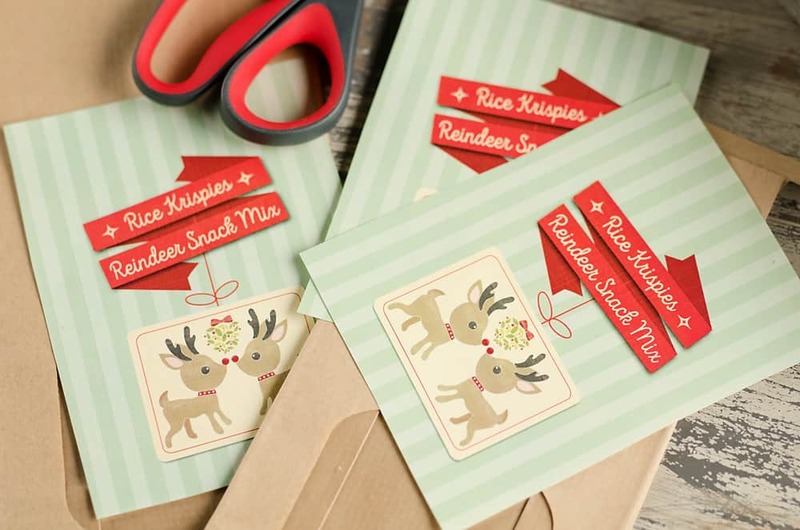 This Peanut Brrr-ittle M&M’S® Reindeer Snack Mix with a Free Printable is the perfect way to show your appreciation to your mailman or let your coworkers know you are thinking of them. 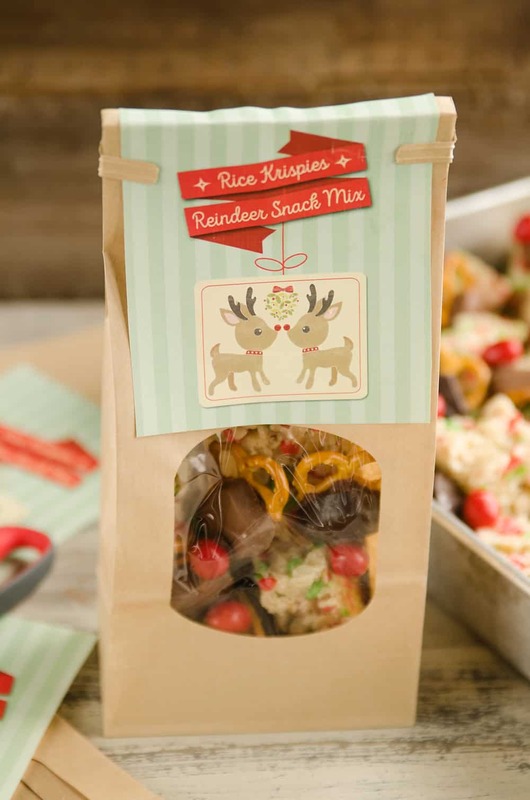 This sweet mix of Rice Krispie treats and homemade chocolate reindeer is a fun and festive treat that children and adults will all love! If you are swinging by your local Target to grab life’s necessities, be sure to venture down the grocery aisles. 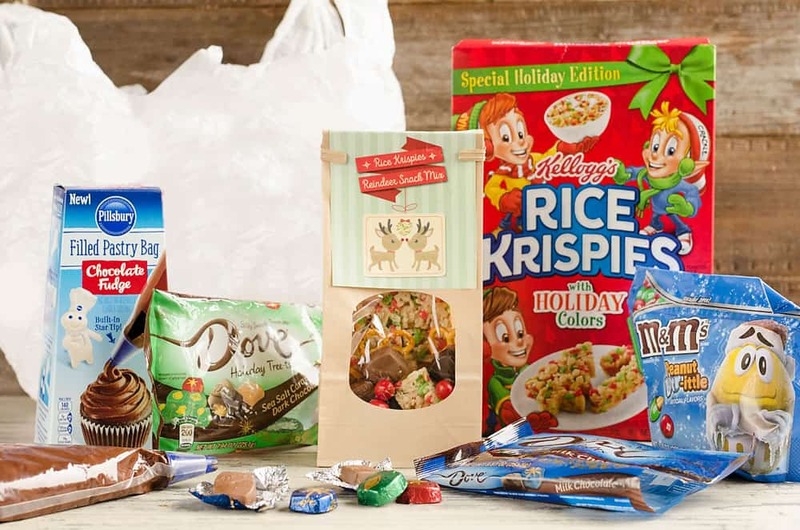 You will find everything you need for the Peanut Brrr-ittle M&M’S® Reindeer Snack Mix including the Holiday Rice Krispies®, pretzels, Pillsbury™ Filled Pastry Bag Chocolate Fudge Frosting, mini marshmallows, butter and DOVE® PROMISES® Milk Chocolate Gifts along with DOVE® PROMISES® Sea Salt Caramel & Dark Chocolate Holiday Tree-ts and M&M’S® Peanut Butter Brrr-ittle candies which are both exclusive to Target! Be sure to use your Target app for 25% off Cartwheel offer for Pillsbury pastry bags and additional savings off Rice Krispies right now! When it comes to decorating any holiday treat with frosting, pastry bags are where it’s at. They allow you to pipe the frosting with precision and add a decorative flare to cookies and cake. Making homemade frosting and filling your own piping bags can be a little bit of a hassle though. When you are looking for a quick fix for you and the family, these new Pillsbury™ Filled Pastry Bags are a lifesaver! The Pillsbury™ Filled Pastry Bag Chocolate Fudge Frosting is all packaged up in convenient piping bags and ready to use. Simply rip the plastic end off the bag and you can get right to work. I used the Pillsbury™ Filled Pastry Bag Chocolate Fudge Frosting to pipe frosting onto the pretzels and DOVE chocolates to assemble the reindeer treats. 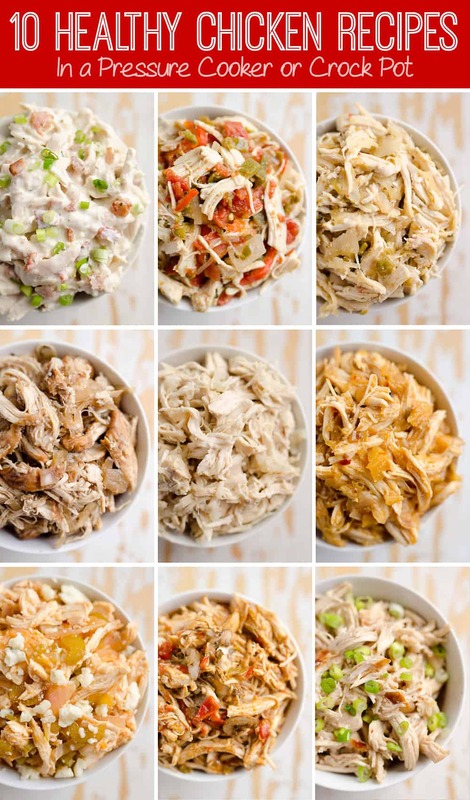 This is a fun and easy activity that the family will enjoy helping with too! After all of your reindeer treats are assembled, allow them to dry overnight. 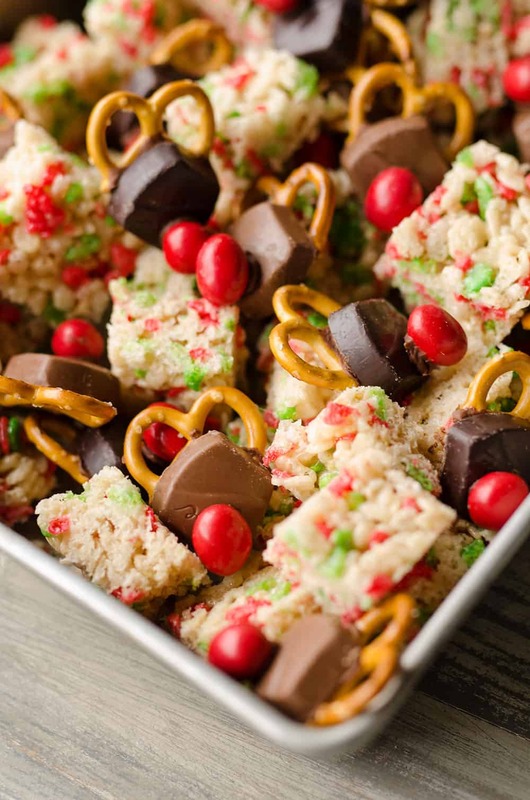 When you are ready to assemble the Peanut Brrr-ittle M&M’S® Reindeer Snack Mix, whip up a quick batch of Rice Krispie Treats using the Holiday Rice Krispies. After they cool for a bit, cut them into small pieces and combine them with the reindeer treats. 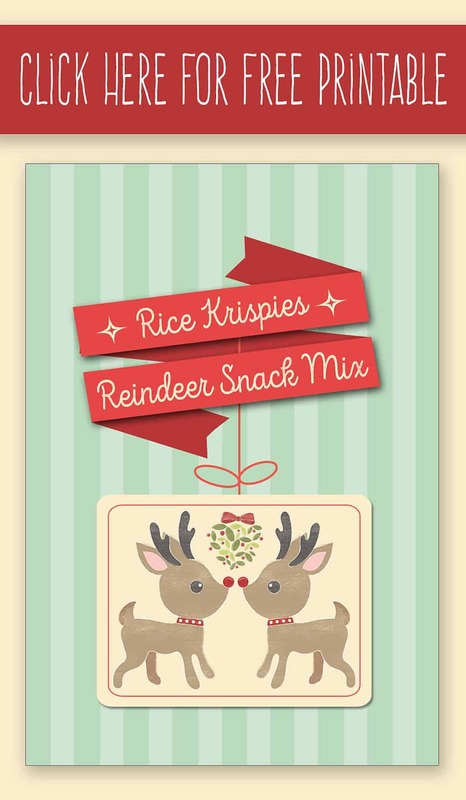 You could just bring a big bowl of these Rice Krispies Reindeer Snack Mix to share with friends or you can package them up in these adorable gift bags with the free printable included below. It adds a fun and personal touch to the package when gifting. 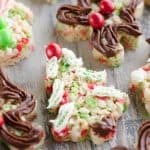 If you are looking for another great option to bring for an easy and festive treat at your next holiday gathering, these Holiday Rice Krispie Treats are perfect for sharing! Simply make a batch of Rice Krispie Treats using the recipe below and after they have chilled for 10 minutes, cut out holiday shapes using cookie cutters. 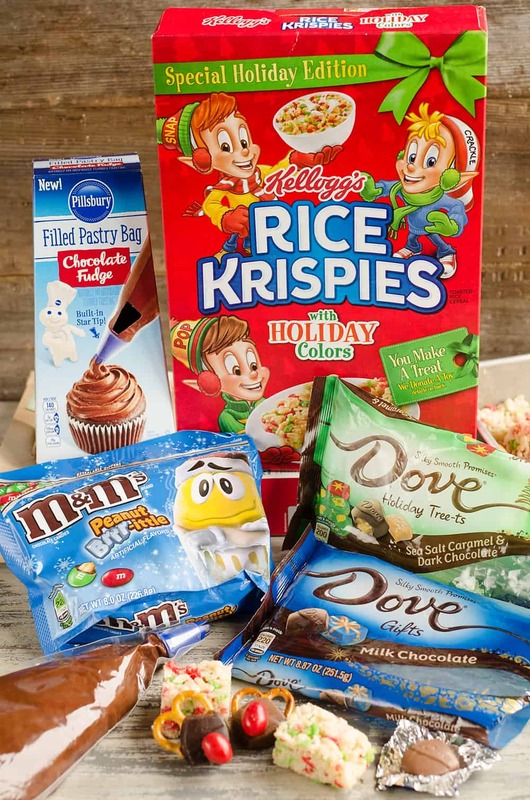 Decorate the Rice Krispie Treats using the Pillsbury Vanilla and Fudge Filled Pastry Bags and M&M’S® Peanut Butter Brrr-ittle candies. This is another great opportunity for the family to pitch in with their decorating skills! 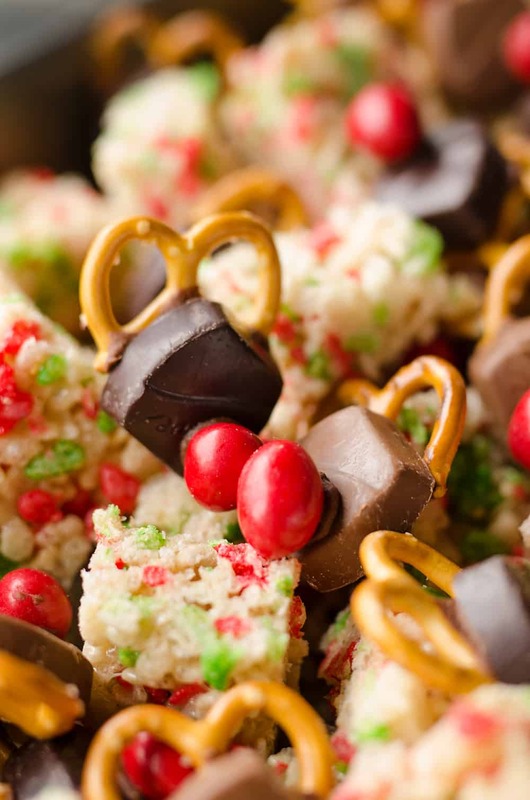 Whether you are whipping up a batch of these Peanut Brrr-ittle M&M’S® Reindeer Snack Mix, traditional Rice Krispie Treats or something with a creative twist, be sure to share a photo on social media with #treats4toys. For every original photo of a Rice Krispies treat posted to Facebook, Twitter, or Instagram non-private account between September 1, 2017 and January 1, 2018, including the hashtag in the post, Kellogg Company will donate $10.00 to Toys for Tots(R) (up to $50,000 total), which will be used to help buy toys for needy children in the U.S.
Rice Krispies Reindeer Snack Mix is a fun holiday treat that is a perfect gift idea for kids and adults! 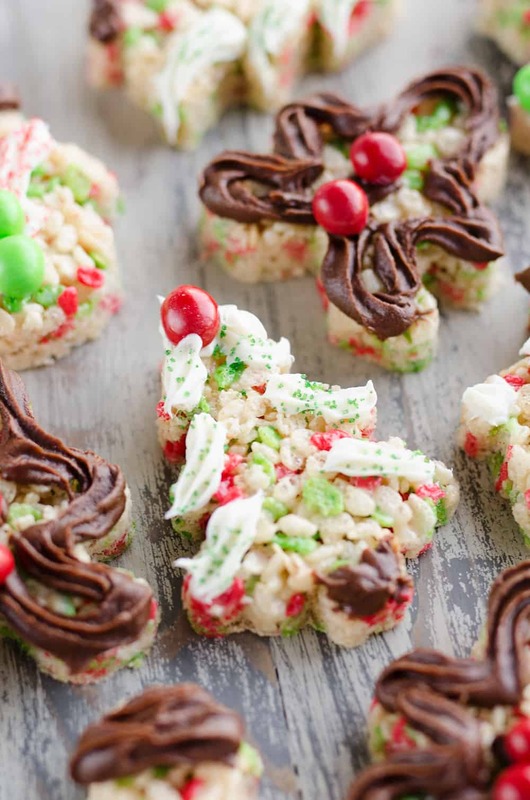 Homemade mini Rice Krispie treats are combined with Reindeer treats created with DOVE Chocolate, M&M's, Pillsbury frosting & Pretzels. In an extra large microwave safe bowl, add the marshmallows and butter. Microwave for 2 minutes. Stir well and microwave for 1 more minute. Stir well and add the Holiday Rice Krispies. Allow to cool and cut into small pieces. Using the Pillsbury frosting, pipe a small circle around the bottom of a pretzel and adhere a DOVE chocolate. Add another dot of frosting to adhere a red M&M candy. Set aside and repeat until 50 reindeer are assembled. Allow to rest overnight. 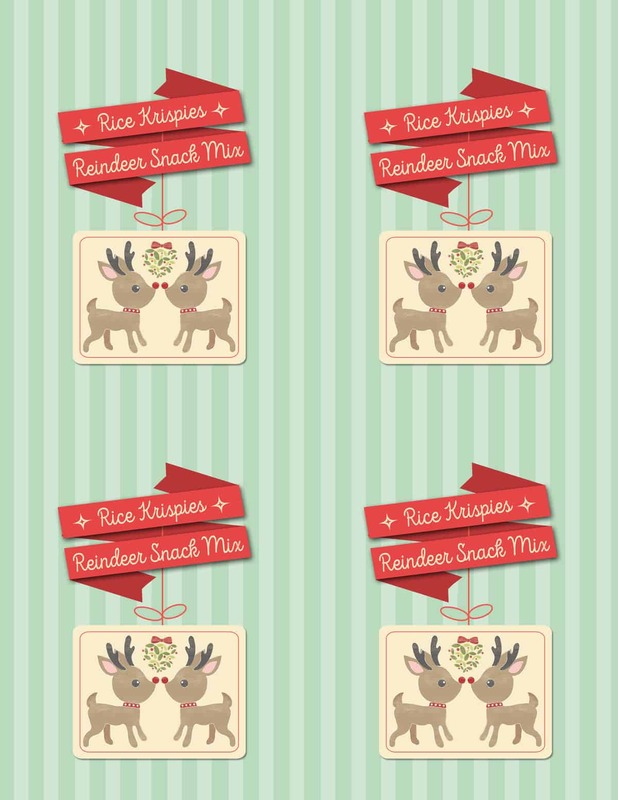 Combine the mini Rice Krispie Treats and reindeer treats into 8 gift bags and attach free printable sign. Enjoy! In an extra large microwave safe bowl, add the marshmallows and butter. Microwave for 2 minutes. Stir well and microwave for 1 more minute. Stir well and add the Holiday Rice Krispies. Allow to cool to room temperature. 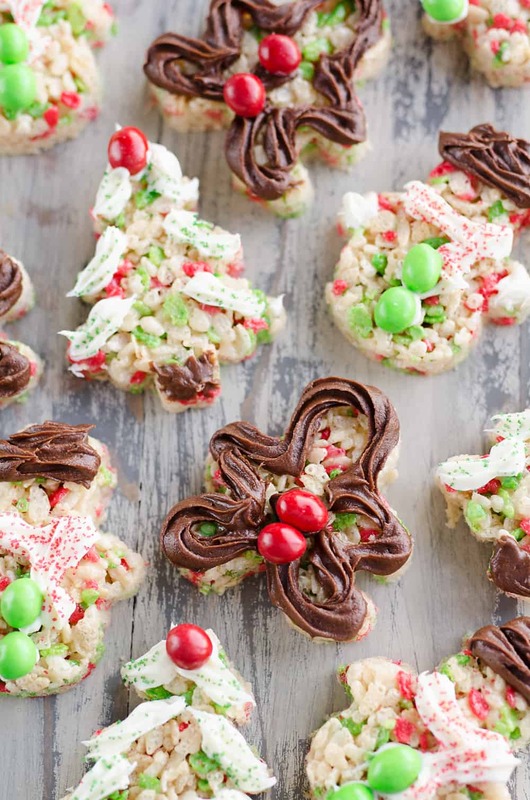 Cut the Rice Krispie Treats into decorative holiday shapes using cookie cutters. Decorate them using Pillsbury frosting, sprinkles and M&M'S. These are sooo stinkin cute. I love the printouts as well. Great job. This is ADORABLE!!!!! I love it!!!! Looks like the perfect little Christmas gifts for our teachers and daycare!!!! I am going to have to keep my eye for those Holiday Rice Krispies!!!! So cute!! I haven’t seen the holiday cereal yet! Oh my gosh, these are so cute!!! Love this idea and my kids would love making them! That is the cutest idea, and that printable is adorable! 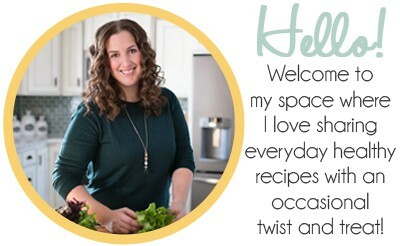 I love, love, love that printable! What a cute way to celebrate the holidays! I can see this going over splendidly with my 2-year-old and her friends! And I can see this being a wonderful teacher gift, too!